Quake III Arena (also known as Quake 3 or abbreviated as Q3A or Q3), is a multiplayer first-person shooter computer video game. 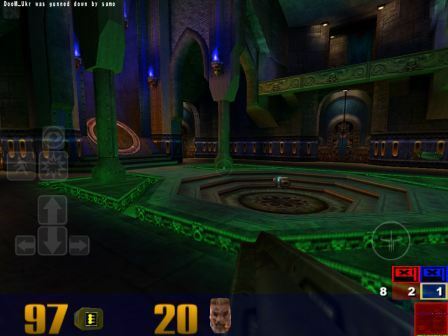 Quake 3 Arena has been ported to iPhone and iPod touch which allows jailbroken iPhone and iPod touch to download, install an dplay Quake 3 Arena via Cydia. Now, the Quake III Arena has also been ported to iPad, as Quake 3 Arena HD. Quake 3 Arena HD is ported from iPhone and iPod touch version of Quake 3 Arena along with several bug fixes and improvements including a full all new control system. The game is controlled by a joystick for looking around and multiple keys on the left to move around and perform action. The controls were designed for the best game play experience possible with the iPad. In Quake III Arena HD, players can use the controls of “left top” as “ESC” and “right top” as “Enter”. Players can also set or configure player name, keyboard settings or other preferences by getting the q3config file from iTunes File Sharing, which will be created at first run, and edit accordingly. Gamers can use the highres textures located here for a stunning game experience too. Quake 3 Arena HD for iPad is free, though players need to purchase Quake 3 to get the CD with PAK files and Key to play retail and online. To install retail version, copy or scp all PAK files into /var/mobile/Documents/demoq3 or /var/mobile/Documents/baseq3 directory, or put all PAK files from aseeq3 via iTunes file sharing to iPad, and then add the q3key file. The iPad must be jailbroken in order to download and install Quake 3 Arena HD. To jailbreak iPad on iOS 3.2.2, uses Limera1n or GreenPois0n. To download and install Quake 3 Areana HD, visit BigBoss repository via Cydia. More information about the release can be found on paduser.com.